80% certified organic cotton, 20% recycled polyester. Enzyme washed. Clean-finished neck seam with woven tape. YKK Zipper. Double-needle coverstitched seams. So how comfortable does this hoodie look! Time to get ready for a change in the weather, and think about Fall apparel projects. The econscious EC5500 Adult 9 oz. Organic/Recycled Pullover Hoodie runs XS-2XL, and comes in six fashion colors, Black, Charcoal, Earth, Jungle Green, Legacy Brown, and Pacific Blue. The material of the econscious EC5500 is 80% certified organic cotton, 20% recycled polyester, and is enzyme washed for a slightly faded look. It also features a 2×1 cotton/spandex rib at belt and sleeves. In terms of decoration, the econscious EC5500 can be treated like any other garment, screen printing, embroidery, etc., it will all work the same on the econscious EC5500 as any other cotton/poly mix hoodie. Indeed we encourage adding a fact about the hoodies 80% certified organic cotton, 20% recycled polyester blend into your artwork, if that is something you wish promoted. Because, without knowing it, this hoodie just looks like a normal – if rather nice – hoodie. The econscious EC5500 are going to work great for any Fall gardening programs, or beach clean up campaigns. 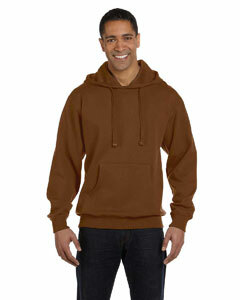 If you business brand is about sustainability, this is certainly the hoodie for you. If you are interested in the econscious EC5500 to promote your own business, email info@proformagreen.com for information and pricing.